Augustus Welby Northmore Pugin was called many things in his own life and after but Cardinal Newman’s simple summation – ‘a man of Genius’ – is perhaps at once the most succinct and the most apt. A designer of buildings, furniture, metalwork, jewellery, textiles, ceramics, wallpaper and books, Pugin was, more than anyone else, responsible for the adoption of the Gothic Revival style as the national style of Victorian Britain and so transformed completely architecture in Britain and Ireland. Perhaps best remembered now as one of the designers of the Palace of Westminster – his most iconic contribution to that project is the clock tower known as Big Ben – Pugin’s Irish buildings, including the Co. Wexford churches at Gorey, Tagoat and Barntown and the Cathedrals at Enniscorthy and Killarney, and the great seminary at Maynooth, are among his best. Pugin’s practice in Ireland was continued after his death by his son Edward Welby Pugin in partnership with George Ashlin. Ashlin married Edward’s sister in 1867 and went on to establish the practice of Ashlin & Coleman in 1903. The Ashlin & Coleman Collection – the first architectural practice archive acquired by the fledgling Irish Architectural Archive in 1976 – contains drawings for more than two hundred churches from Cobh Cathedral in the south to Newry Dominican Church in the north, almost every one a variation of a Puginian Gothic style developed and rigorously implemented by the practice. In 1834 A.W.N. Pugin visited Nuremberg in Germany. He returned with a ‘vision of the Gothic transformed’ for in Nuremberg ‘Pugin’s dream of a revived Christendom, made manifest in art and architecture, was at once all before him’ (Rosemary Hill, God’s Architect: Pugin and the Building of Romantic Britain, (London 2007), 126). 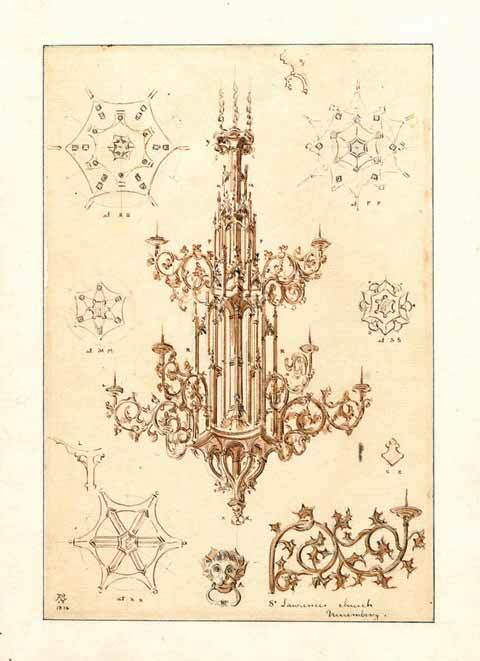 He returned to Nuremberg in the summer of 1837 an some of his sketches from this second seminal visit – interiors and decorations of Nuremberg’s churches –survive in the Irish Architectural Archive, a tangible product of one of the most transformative experiences in Pugin’s short life. 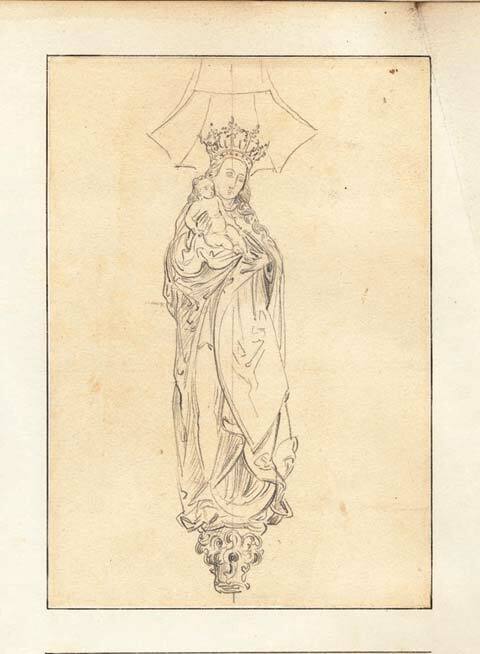 It is our hope that, on the occasion of the bicentenary of Pugin’s birth, the presentation of these beautiful drawings to the public for the first time will engender an appreciation for this most remarkable man and bring into focus the remarkable Gothic architectural legacy which he and his successors have left across Ireland. 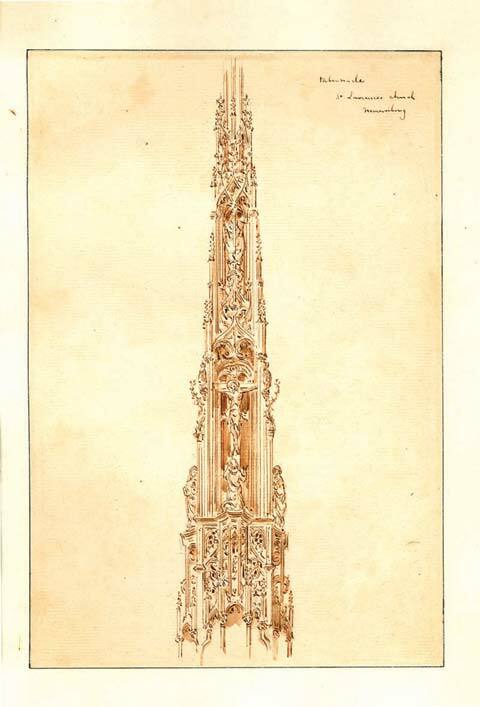 To coincide with the exhibition, the Archive has produced a book containing reproductions of the drawings, an essay on Pugin and Ireland by Dr Roderick O’Donnell, and a gazetteer of Pugin’s Irish works compiled from the Dictionary of Irish Architects. The Gallery is open to the public from 10 am to 5 pm, Tuesdays to Fridays. In addition, a lunch-time lecture series exploring Pugin’s architecture and legacy will run in the Archive throughout March 2012. For more information click here. The exhibition runs in the Architectural Gallery at the Irish Architectural Archive from 2 March to 17 August 2012. The Irish Architectural Archive wishes to acknowledge the financial assistance provided under the Built Heritage element of the Environment Fund by the Department of Arts, Heritage and the Gaeltacht towards the ‘Celebrating Pugin’ exhibition and book. The Archive also wishes to acknowledge the support provided for this exhibition by the Heritage Council.